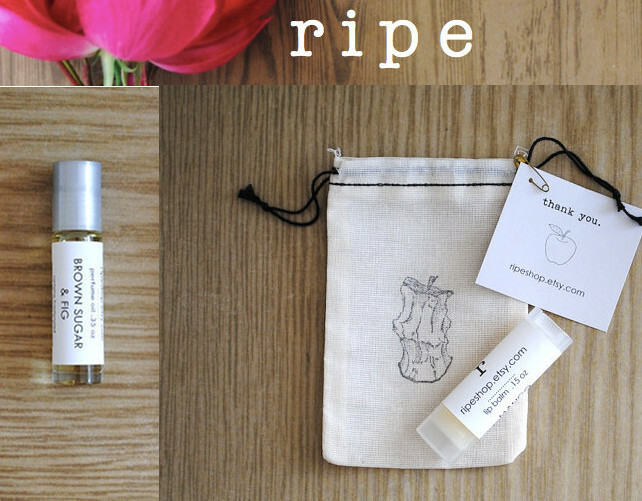 I’d been eyeing Ripe Shop for a while, like I mentioned the other day, packaging really gets me on Etsy when it comes to beauty products, Ripe Shop is totally one of those shops. I really just wanted the perfume oil but figured if I was paying shipping I might as well get a lip balm, because who am I kidding I love lip balm. The balm is super emollient and moisturizes very well. Its not in their Etsy store anymore, but I picked up the Vanilla Bourbon one, the taste is a super deep vanilla, I can’t detect the bourbon but I think whatever makes it bourbon-y makes the vanilla really deep and mysterious– not candy like at all– which I really appreciate. Ahh the perfume oil. So in love! I chose Brown Sugar & Fig, based largely on a whim as I did not have a chance to smell it, but I just went with my gut. The scent is really unique, it smells like summer at dusk or what I think a perfume trying to be summer at dusk would smell like. Its sweet but it has depth, there is a powdery element that is slightly masculin to even out the sweetness. It actually smells quite similar to this perfume but way more affordable.